plus613 - culture in the blender - I was only a King Brown... how bad could a bite (or 9) be? I was only a King Brown... how bad could a bite (or 9) be? Comments for: I was only a King Brown... how bad could a bite (or 9) be? 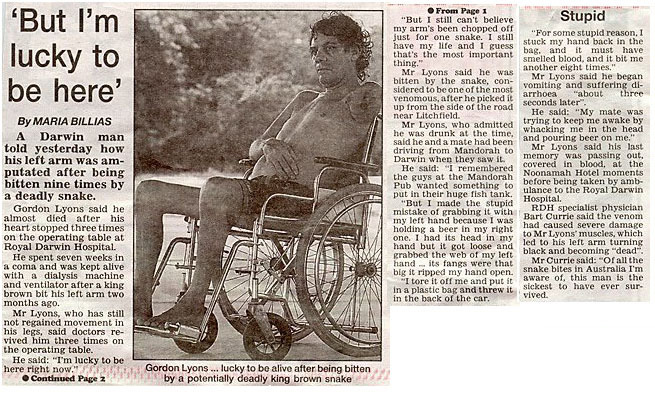 I love the bit about "I picked it up in my left hand because I was holding my beer in my right"
A friend sent this to me a long time ago suggesting this guy for a Darwin Award, but he survived, so he's not eligible.